Check out KXLU's show, "Alma Del Barrio," on National Public Radio in Los Angeles, on the air for 25 years! DJ: Alan Geik. Times: Sat & Sun, 6 AM to 6 PM, 88.9FM. 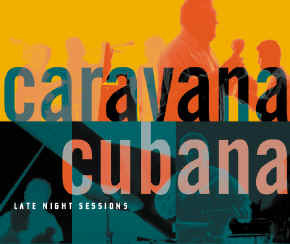 Alan produced a very fine album with an interesting story, Caravana Cubana. The idea for this recording was born during a memorial service in April 1998 for Emilio Vandenedes, a respected public radio broadcaster in Los Angeles and Miami. Emilio was a fervent supporter of Cuban music and had many fans, both in Cuba and the U. S. The music at his memorial was filled with passion and inspiration, performed by many of the musicians who had known and loved him. As Emilio's longtime friends and former colleagues (at KXLU's "Alma Del Barrio"), we were moved by the great intensity of the performances. Along with our partner George Hernández, a film producer and co-founder of the Los Angeles International Latino Film Festival, we began what we thought would be a modest recording project featuring several of the musicians from Emilio's memorial who have had long careers but had never received the recognition they deserve. As the recording got underway, many of Cuba's best-known musicians expressed great interest in reuniting with some of their old friends and fellow band members now living in the U.S. Many had known Emilio as well. Late Night Sessions turned into a series of reunions, both musical and personal, beginning with the very first session. Al McKibbon (the bassist who played Afro-Cuban jazz with Dizzy Gillespie and Chano Pozo in the late '40s) and Francisco Aguabella reunited here after first working and recording together 36 years ago. L.A.-based José Caridad Perico Hernández reunited with his childhood friend Jesús Chucho Valdés, and also with his fellow sonero (singer) from '50s Havana, Pío Leiva. The reunions were not limited to the older players. Three young, extraordi-narily talented musicians, Miguel Angá Díaz, Orlando Maraca Valle and Carlos Del Puerto, Jr., who had recorded together many times in Cuba, also reunite here. Carlos also had a chance to play with, and pay homage to, one of his musical inspirations, fellow bassist Al McKibbon. Del Puerto's arrangement of Cuban classical composer Ernesto Lecuona's "La Comparsa" features solos by both outstanding musicians. These reunions turned into a celebration of Cuban music-its past, present and future-and of the musicians who interpret it with such passion. Emilio Vandenedes was the subject of a tremendo tribute at the '98 Jazz Fest in Havana.